INAHTA values collaboration with the international HTA community and broader global health community, and we are proud to collaborate with the following organizations. In the 21st century, health is a shared responsibility, involving equitable access to essential care and collective defence against transnational threats. WHO is the directing and coordinating authority for health within the United Nations system. It is responsible for providing leadership on global health matters, shaping the health research agenda, setting norms and standards, articulating evidence-based policy options, providing technical support to countries and monitoring and assessing health trends. A Memorandum of Understanding (MoU) between INAHTA and the World Health Organization was signed at the INAHTA Annual Meeting 2009 in Singapore. In 2015, an amendment was added to the MoU, identifying new areas of collaboration aligned with the strategic directions of shared interest between the WHO and INAHTA. The photo above is of Ms. Adriana Velazquez Berumen (WHO) and Dr. Brian O'Rourke (Chair, INAHTA Board) signing the amendment in Oslo, Norway in June 2015. Health Technology Assessment international (HTAi) is an international professional society focusing specifically on HTA and embracing all those who do and use it, whether in academic institutions, health care facilities, industry, business, the voluntary sector, or government. HTAi's mission is to provide a key forum for those from the worlds of health care, academia, and business interested in the science, development, and application of HTA. To support and promote the development, communication, understanding, and use of HTA around the world as a means of promoting the introduction of effective innovations and effective use of resources in health care. A Memorandum of Understanding between INAHTA and HTAi was signed at the HTAi Annual Conference in Montreal, 2008. The Guidelines International Network (G-I-N) is an international not-for-profit association of organisations and individuals involved in the development and use of clinical practice guidelines. It is a Scottish Charity with governance arrangements addressed in its Articles of Association. G-I-N seeks to improve the quality of health care by promoting systematic development of clinical practice guidelines and their application into practice, through supporting international collaboration. A Memorandum of Understanding between INAHTA and G-I-N has been signed at the INAHTA Annual Meeting in 2009. The International Information Network on New and Changing Health Technologies (EuroScan) is a collaborative network of HTA agencies for the exchange of information on important emerging new drugs, devices, procedures, processes, and settings in health care. The members of EuroScan aim to establish a permanent network among agencies and organisations in the field of HTA to: 1) Evaluate and exchange information on new and changing technologies; 2) Develop the sources of information used; 3) Develop applied methods for early assessment; and 4) Disseminate information on early identification and assessment activities. All EuroScan members are members of INAHTA. A Memorandum of Understanding between INAHTA and EuroScan was signed in 2009. European network for Health Technology Assessment (EUnetHTA) coordinates the efforts of 27 European countries including 24 Member States of the European Union in evaluating health technology in Europe. Initially, the EUnetHTA project is being co-financed by the European Commission (DG Sanco) and contributions from network members. EUnetHTA connects public national/regional HTA agencies, research institutions and health ministries, enabling an effective exchange of information and support to policy decisions by the EU Member States. INAHTA has an Memoranda of Understanding with EUnetHTA signed at the INAHTA Annual Meeting in Bilbao, 2012. Several of INAHTA's, especially European, members participate in EUnetHTA. A Memorandum of Understanding was signed between EUnetHTA and INAHTA in 2012. HTAsiaLink is a network to support collaboration between Asian HTA agencies, with a focus on facilitating HTA research by accelerating information and resource sharing and developing an efficient methodology for HTA in the region. Several INAHTA members are also members of HTAsiaLink, and INAHTA participates in regional HTAsiaLink meetings. A Memoranda of Understanding (MOU) was signed between INAHTA and HTAsiaLink in May 2016. 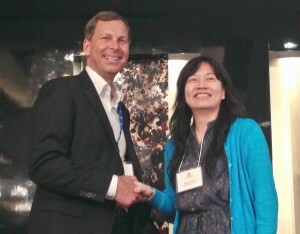 The photos below are of Dr. Jasmine Raoh-Fang Pwu (HTAsiaLink) and Dr. Brian O'Rourke (Chair, INAHTA Board) signing the MOU in Tokyo, Japan. RedETSA is an HTA network of the Americas with members from 27 countries across North and South America. PAHO is the Secretariat of the Network. Recent activity includes the mapping of HTA capacity in the region and opportunities for further development of human resources in HTA. A Memoranda of Understanding (MOU) was signed between INAHTA and RedETSA in August 2016.